With the new Adobe Integrated Runtime (AIR) for iOS publishing options, developers can now use Adobe Flash CS6 as a development platform for apps and games on the iPhone and iPad. For development on the Apple iOS platform, visit iOS Developer center to set up a new developer account and get started. Consult with your development team, IT department, or employer to find out about the available test devices, simulators, and existing developer accounts needed for your platform of choice. Before starting or publishing an application, make sure it meets the guidelines suggested by the respective SDK or Developer Center. You can get started in the right direction by using one of the pre-sized AIR for iOS or AIR for Android document types. Choose File→Publish Settings and make sure the Target is set as AIR 3.2 for iOS. Click the Player Settings button to the right of the Target drop-down list to open the AIR for iOS settings dialog box. Under the General settings tab, fill in the appropriate name and output file for your app. Make sure that settings for Aspect Ratio, Render Mode and Device are correct for your application. Under the Deployment tab, select the certificate provided to you for iOS development as part of your developer account and provisioning profile. Also, specify your provisioning profile. A provisioning profile is created as part of your iOS developer account, and ties you (as well as other developers) to a set of test devices and an authorized development group. If you are a designer/developer within an organization, it’s possible that you can obtain this profile from your IT department, development manager, or whoever manages your company’s developer account with Apple. Select your Deployment type, which determines how the app is packaged. 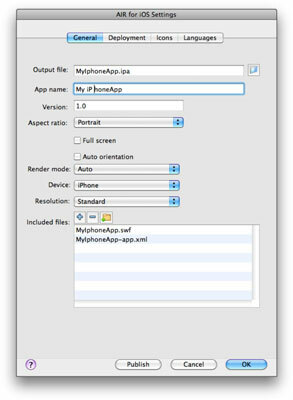 You can package it for final App Store delivery or specifically for local testing and debugging. Under the Icons tab, specify an icon graphic file for each of the required icon sizes as shown. For specs and guidelines on preparing icons for an iPhone or iPad application, refer to the iOS developer center. Under the Languages tab, select the languages your application is targeting. If you’re focused only on North American and English-speaking users, select English for now. If you’re working as part of a team, make sure to consult with your development team or employer to make sure this setting is correct. Click OK to close the AIR for iOS Settings dialog box. Click OK to close the Publish Settings dialog box and save your options, or click Publish to publish your application right away.